"A good game, verging on great"
This review covers the PC version of Stardew Valley. I got this for Christmas from a friend we will call 'Jamie', because that's their name. Through a mix of their huge enthusiasm and my shameful nostalgia-tinted glasses Stardew Valley had been on my radar for quite a while. As the most recent Harvest Moons have included a self-congratulatory puzzle game and as much evolution as a fundamentalist boot-camp, it's no wonder that when told about a game which apes the older 16bit games in the series and improves upon them, players flocked to 'Stardew'. When you start a game you get a really nice, if basic, character creation option, letting you insert a farmer that is more to your taste, looks-wise. It's not that varied, but by adding colour sliders it adds far, far more variety than in any Harvest Moon game. This is a wonderful touch as it immediately gives you a reason, even just a small one, to feel invested in this character and makes a change from the typical “here's a boy and if you're lucky a girl, pick one” of its inspiration. The intro is nice too, showcasing your character having a breakdown whilst working in a bland and isolated cubicle, leading to them deciding to go and work on what was once their Grandfathers farm. From there, however, it starts to go a little bit awry. Once you're at the farm the game tells you very little in regard to its story and, most importantly, the story constraints. 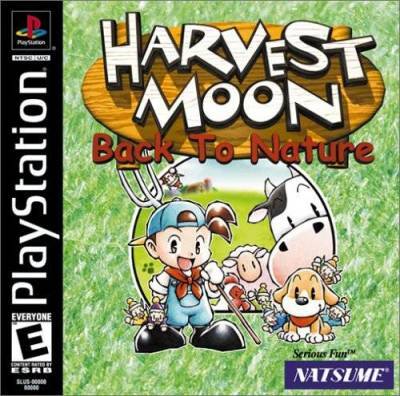 For an example of how to do this right, lets take a look at one of my favourite Harvest Moon's, Back to Nature on the PSX (what eventually got rebranded as the Playstation One). It's 32bit (barely) but I adore this game. Within minutes of getting to the farm it has been conveyed that you are on a timer. You need to make this farm succeed and be a part of the community within three years or you're out. No searching around for hidden letters from Grandpa, no inferred issues with your past employer told much later on, just “join us or lose”. Controls are covered as you play and are kept simple. This is important as it gives players a clear end goal and doesn't leave them stranded pressing buttons to figure everything out, running the risk of leaving them feeling overwhelmed and unsure if their actions are right or if they've crippled their future progress. With Stardew, you turn up, are talked at at length and at no point does the hint of a true end goal come up. What are you working toward? Who cares, just run this farm. How do you do that? Hammer buttons until something works and check the control menu which doesn't explain much. You EVENTUALLY get a hint that something is going on by searching around the farm and town. In the time leading up to that I had almost no investment in the town, the farm or the story and for a slow game that can be an absolute killer. Control wise it's mostly very good, poor communication notwithstanding, and the controller support is actually pretty impressive. I've used an Xbox controller, tested a joytech controller and even mapped controls to my X52 aviator joysticks and it's easy to do and works really well. There is one point when the controls feel awful and that is the fishing game. I played it and managed relatively well. I figured out how to do it myself with only the visual clues and managed to level up to fishing level 3 by the end of the season. So, if the controls are usable and I'm finding it simple, why does it feel so horrid and lazy? Essentially, fishing has always been capped in the games in the Harvest Moon stable. You want to catch something, you need a rod. You want to catch something bigger you need bait and a better rod. The rods act as levels and allow you to progress in a way that flows naturally with your abilities and resources in-game. Stardew abandons this flow and instead uses a random number generator. This would be fine if explained but this game seems to genuinely hate educating players. Lots of people like this system and it does work, but if you're a new player it can be massively disheartening. You get random fish of all levels going for your fishing rod but the number of powerful fish is higher than the number of level 1 or 2 fish. So if you are level 1, catching something is extremely difficult. A staggered release of higher level fish would make this much less off-putting to new players, as would any indication that this is how the system works, so I can only presume either wilful ignorance and a focus on series veterans (and not even their own series) or laziness. The fishing in Nier is better balanced and flows more naturally. And that games fishing mechanic was a about as useful as a used rubber johnny in a canal. 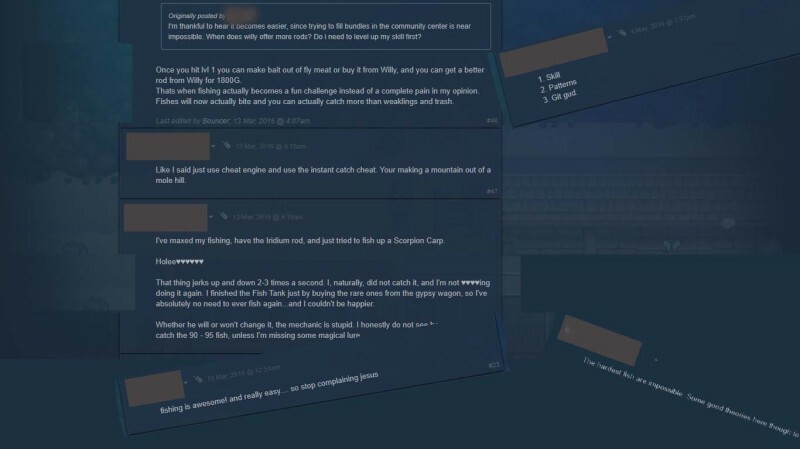 Whilst researching this and seeing if I was correct about it being an issue for a lot of people I found that, for a game meant to be a relaxing experience, it has some of the most toxic online community members I have ever come across. If a new player voices dissatisfaction or an inability to find or do something they immediately become targets for all of the “git gud” twatsanders. It's a knock-off Harvest Moon, not Dark Souls and that behaviour is crass and embarrassing even there. This shows up especially when people point out potential improvements or areas that could be made fairer or less obtuse to the point where others tell them to hush because they're wrong, they just are, so there. Just because you love something doesn't mean it's perfect. I mean, crap on a bap, I'm not perfect but my fiance still loves me. It's not because I'm magical and awesome (I am, shut up) it's because he can love the good parts enough to overlook or accept the bad. Games, music and anything really comes with that caveat. Speaking of music I've been genuinely impressed with it, though I did find that certain tracks and sounds started to get repetitive and annoying very quickly. The stand out moment for the soundtrack, for myself at least, was during a jellyfish-themed festival on a night. It was almost entirely silent and as the jellies floated in the music swelled very quietly in the background. Which made sense – it was night-time, no-one wanted to scare the creatures away and it was built up as a rare and almost mystical moment further emphasised by the choice of music and it's level. At times the soundtrack is frankly amazing and really improves the experience. One of the things that became apparent whilst playing was that bigger is not always better and in this case, 'Stardew Valley' starts to feel like an over-ambitious fan-project. To know what doesn't work in Stardew Valley we need to know what worked in those earlier Harvest Moons. The village in Back to Nature was small, so when you walked around it mapping out where non-player characters would be was easier and created a sense of intimacy – it felt more like you were part of this little community, rather than separated from it, especially as events involving your favourite people were more likely to trigger. Giving them more of a backstory and sense of personality. Each character had a very distinct design too, so they felt like they were their own people which is something Stardew does have a slight problem with. The graphics don't really lend themselves to making especially varied npc's – this was a problem for the very first Harvest Moon (I don't recommend it, Back to Nature and even Tale of Two Towns are much, much better), and you can see that Stardew Valleys' creators have tried to fix this in the same way, by making sure character portraits are big, bright and full of life. This lent itself well to Harvest Moon where the characters are very cartoonish but works better here as the increased colour palette gives individual characters a very distinctive colour-coded look. If they area were smaller, more compressed, it would give a more cohesive view of their world and I would really like to see that. As it stands it's still very good with loads to do, including one baffling section to me. It has a dungeon. Where you kill slimes. For a game that pushed the Harvest Moon replacement message so hard it actually has a lot more in common with Rune Factory. The Rune Factory series is pretty good and has the same combination of farming and dungeon crawling which compliment one another very well. Basically, if you like Stardew Valley and Harvest Moon, give Rune Factory a go. It's pretty much Stardew valley with a more focussed story and a fantasy setting. Replaying the game for this review brought a lot of the niggles I had about the game on my first run to the fore, but there's one thing that has stuck with me – that it was fun. Yeah, it has problems but with the crafting elements, characters that are at least interesting and more inclusive than a lot of games, really rather lovely area graphics, loads of additional things to do and some of the best music I've heard out of a game in a long time I recommend it wholeheartedly. Stardew Valley is so close to greatness, but stumbles in a couple of the fine details. A good game, verging on great, but missing some of the charm and personality of the titles it attempts to emulate and expand upon. I really hope that this title improves in any future instalments and I will probably end up playing them all. ​We are independent, honest and ever so teeny. Teeny, teeny DEATH!